The Raindrops Monsoon Fiesta, on July 8, 2017, the celebration of the second anniversary of the 'KCA Monsoon Theme' Social was attended by over 200 Members, their families, friends, and children at the premises of KCA, Mumbai. The KCA Cultural and Recreation Team, often tasked with planning and organising Socials, infused fresh ideas into the tried and tested 'Live Musical Evening and Banquet Dinner', and invoked amongst the social gathering - genuine realisation, appreciation, and celebration of a memorable and enthralling evening. The Raindrops Monsoon Fiesta commenced with the KCA Young Achievers Awards Ceremony. In keeping with the tradition of recognising the academic achievements of children amongst our community of Members, the Managing Council of KCA, Mumbai, revived the KCA Young Achievers Awards. This year, the Awards was designed to commemorate and felicitate young achievers for their excellence, skill, and talent in the categories of academics, sports, and music. Ms. Anna Correa (KCA Life Member and Principal of St. Stanislaus High School) delivered a short key note address on the significance of the Awards, and the impact its recognition will have in motivating and spurring the Young Achievers into higher realms of excellence. Mr. Praveen Pereira (Hon. Secretary) gave the audience a brief insight into the accomplishments of each of the Young Awardees. At the Awards Ceremony, 15 children of KCA Members, were honoured for their excellence and achievements, and each of them were felicitated and presented with a Certificate of Honour and a Cash Award. The KCA Junior Athletics Team were also honoured for winning the Team Athletics Championship in the Bandra Neighbourhood Winter Festival 2016, and Catholic Gymkhana Annual Athletic Meet 2017. The Cultural and Recreation Team would like to thank the parent community of Members for sharing the accomplishments of their children with us, thereby, allowing the larger community of KCA Members to collectively celebrate the achievements of these Young Achievers; and sincere appreciation for the support extended by the Managing Council in making the Awards possible. The latest issue of ‘Amchi Khobor’, i.e., Vol. 2, Issue No. 2, titled 'The Spirit of Enterprise', containing numerous insightful articles, was released by Dr. Christopher Rego, Senior Member of KCA and former Member of the Managing Council of the Association. The husband wife duo of 'Michael and Sunita', renowned for their regaling performances at many a five star hotels, clubs and gymkhanas, kicked off the merriment for the evening with their live music performances, standing true to their repertoire of delivering rendition of good live music and entertainment. 'Michael and Sunita' connected beautifully with the gathering, and the richness and depth of their live performance at the Raindrops Monsoon Fiesta, remains a memorable experience voiced by numerous Members and Guests. Members and Guests were provided with beverages and a spread of delectable dishes for dinner, and as the evening wore on in celebration, it was gratifying to observe the gathering having a wonderful time, building relationships, forging friendships, and breathing renewed vigour, energy, life and vitality to the social calendar of this 116 year old institution. The resonance and grandeur of the Raindrops Monsoon Fiesta, being spoken about with immense positivity in many circles, has created a ripple effect of demand amongst Members and Guests, for similar and frequent Socials to be held at the KCAi. The Cultural and Recreation Team takes this opportunity to express its appreciation to all those who took time away from their schedules, to honour and appreciate our Young Achievers, and to celebrate the spirit of Monsoon with our community of Members and Guests. Till then, we warmly wish you and your family a 'Happy and Safe Monsoon'. "Life has a way of constantly coming at us. Day, hours, and moments are filled with urgent demands requiring our immediate attention. When the demands of life leave us rushing from place to place with scarcely a moment to spare, we may fail to pause and thank our Creator for His gifts. But, whenever we neglect to give proper thanks to the Father, we suffer because of our misplaced priorities." The Annual Thanksgiving Mass and Dinner, on April 22, 2017, was well attended by more than 200 Members, their families, friends, and children at the premises of KCA, Mumbai. It served as a time for remembrance and communal thanksgiving, an opportunity for our community to come together in fellowship, invoke reflection of gratitude, and celebrate the many blessings this community institution, in the past and present, has bestowed upon its community of Members. The Mass, a solemn act of thanksgiving, was celebrated by our KCA Member, Bishop Percival Fernandez, who in his homily, elaborated upon the broader significance of thanksgiving, and stressed to those in attendance, the call to fight forces of disunity and disharmony, to sink personal differences in the larger interest of the institution and its community, to work ceaselessly within and outside the community, to be torch bearers of peace, communal harmony, and solidarity in taking forward this 116 year old institution. At the conclusion of the Thanksgiving Mass, the President of KCA, Mumbai, Mr. Sunil Alva gave a brief presentation highlighting the initiatives and progress by the Managing Council. Since the new team was elected in October 2015, 18-months into its 3 year-term, April 2017 marked an apt moment to do a 'mid-term review'. He provided a 360-degree review of the various aspects of our institution, including the work of the sub-committees, the community services run by the KCA as well as other aspects like our newsletter / website, legal / finance matters, building repairs and other organizational matters. He reiterated the commitment of this Managing Council to the philosophy of transparency, and vision to further enhance the outreach, credibility, and reputation of the Association. He encouraged members to provide suggestions and come forward to help in making the Association relevant to the needs and demands of the current times, whilst also respecting its rich culture, heritage, and history. Bishop Percival Fernandez inaugurated and blessed the ‘Sports and Fitness Centre’, in the presence of the Managing Council, the Sports Sub-Committee, and those in attendance at the Annual Thanksgiving Mass and Dinner. Sports & Fitness is launched as another Community Service of the KCA, thereby, expanding to members and others, the offerings of a well-equipped Fitness Centre, badminton, table tennis, carrom, scrabble, yoga, dance etc., with the hope that this ‘Sports and Fitness Centre’ will be an asset for those aspiring to further their sporting ambitions as well as those who simply want to keep fit! 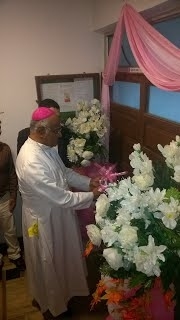 In keeping with the spirit of thanksgiving, and showing gratitude to the stalwarts of our community and institution, a floral tribute was paid to the portrait of our Founder President, Hon’ble Dr. Major Cajetan Fernandez MD, JP., by Mrs. Helen Saldanha, Ms. Christine Saldanha, Mr. Robin Saldanha, Dr. Rui Fernandez (direct family members of the Founder President) and Dr. Kranti Farias. A literary tribute, by Dr. Kranti Farias, to the life, works, and contribution of the Founder President to this institution and community is featured in the latest issue of the ‘Amchi Khobor’. The Music Band ‘Two Girls and a Guitar’, kicked off the merriment for the evening with their live performance, vocal and dancing skills, and plethora of beautiful songs; encouraging the gathering to sing and dance along! There was much singing, dancing, bonhomie and fun, with the crowd soaking in the atmosphere of an evening filled with camaraderie and fellowship. As the evening wore on in celebration, it was time to partake in the traditional Annual Thanksgiving Dinner. Dr. Kranti Farias led the gathering in the Grace before Meals, and counters were set up where beverages and a banquet consisting mainly of Mangalorean delicacies was served. Ms. Jessie Vaz, Managing Council Member, proposed a Vote of Thanks. The Cultural and Recreation team takes this opportunity to express its appreciation to all those who took time away from their busy schedules, to be a part of this annual event at KCA, Mumbai, for the presence of each and every one made the evening truly memorable. May the spirit of thanksgiving rest with each of you and the true essence of this joyful occasion transcend your lives, your family, your home with countless blessings and happiness. The uneven sound of rain drops outside our hall was drowned by the sweet melody of music inside the hall! The informal gathering, which came in casual wear at the KCA ground floor hall all looked set to have a good time. Yes, dear members this was indeed one of the first in a series of such events in the months to come. The decor and the blue lights created an ambience of a perfect dance party for our members and their guests. As the invitees trouped in, they were greeted by soft sweet music of yester-years, some of them tapping their feet to the beat and others trying to sing along. It was good to see everyone hunting for a nice cosy place to settle down, to spend the evening set before them. To see us through the evening, we had our very own member, Mr. Merwin D’souza, who as Master of Ceremonies lined up the type of music and coordinated the dance sections with the DJ. While the music played, guest moved in to buy their favourite hot barbeque snacks which started rolling out from the charcoal pit. Yes, some like it hot specially when the rains keep beating down! There were other interesting snacks like Choris Pau, mutton cutlets etc. followed by a dinner choice of pork sorpotel with sannas, Chinese food and other tasty stuff…Hay, hay, we better stop before we make your mouths water! We also had a doctor’s medicine corner where peg measures along with suitable mixtures were provided to enliven the spirits of the rain dancers!